When I started going to yoga at the Breathing Room, I was using my cheap $15 mat from Walmart. To say it was slippery was a vast understatement. I admired their selection ofJade Yoga Mats for over a year before I took the plunge and bought one. I wasn’t totally committed to my practice, so I figured I could get by with my old Pink mat. I bought my Jade Yoga Mat (Harmony Professional in Olive Green) over a year ago. It was honestly the best money I have spent on Yoga gear. It is SO sticky and even better, it is eco-friendly. Jade mats are made with natural rubber and contain no PVC, other synthetic rubbers, heavy metals or ozone depleting substances. Natural rubber is tapped, like maple syrup, from a rubber tree, a sustainable, renewable resource. How cool is that!? Jade Yoga Mats also plant a tree for every mat they sell! My inner hippie squealed when I found that out. 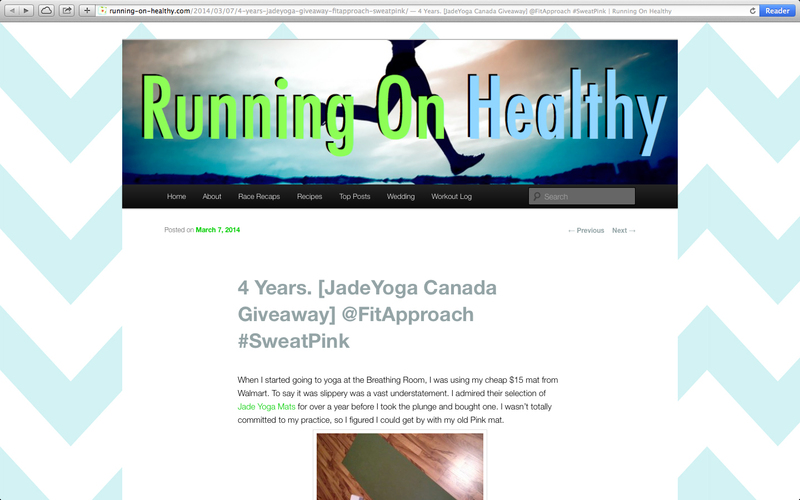 I contacted JadeYoga Canada to see if I could partner with them for a giveaway for my Big 4 Year Blogiversary. As it is already a product I use and love, I thought it would be perfect to share them with my readers. Steef at JadeYoga Canada was so awesome to work with, and he even sent me a second Mat, a brand new one for me and one to giveaway! JadeYoga Canada recently released some fun new colors, so today I am giving away a Key Lime Harmony Professional Mat to one lucky guy or gal! My Key Lime mat is so vibrant. It is the same, high quality material as my Olive Green Mat that I have in my “Yoga Room” in my basement. My Key Lime Mat stays in my car at all times so that I don’t get any dog or cat hair on it (haha), but I did take the one I am giving away out of the paper wrapping to snap a quick photo! I’m so excited to be giving a mat away to a Canadian Reader. Comment on this post to enter! 4 Years ago I was in a really unhappy place. I felt helpless over my weight and my emotions. My binge eating was spiraling out of control. I had little energy. I never moved my body unless it was to and from the couch to the car or bed. I was trying my best at Weight Watchers Online. I was in a relationship with my now-husband, but we were both unhappy with ourselves and disconnected from one another. 3 Years ago I was well on my way to change. I had lost 30+ pounds. I had given up meat. I started counting calories. I was learning to run and signed up for my first race. I exercised 4 days a week. I felt more positive about myself physically, but I was still struggling with my internal battle of values and self acceptance. I was very single. I had no time for any type of relationship with Nursing School. 2 Years ago I was at my goal weight but starting to gain weight back, about 5ish pounds. I was terrified, upset, and frustrated with myself. I felt like a failure before I had even gained a single pound back. I was working on my Nursing Preceptorship and living with my brother in Edmonton. I was newly back with my Matthias, and things were going stronger than ever. He reinforced that he loved me regardless if I gained back any weight and that I was perfect as I was. I was training for my 3rd half marathon. I was still counting calories. Exercising probably a bit too much, but it was the only thing I felt I had total control over with managing my weight. 1 Year ago I had gained back approx 20lb. I was emotionally fragile as I was working through past issues with my biological parents and learning to let go of my emotional baggage. Matthias and I were planning our perfect, small wedding, and we continued to be strong and happy. We started traveling together and went on a trip to Mexico. I’d stopped counting calories all together. I added fish back into my diet. I was training for my first full marathon. I was loving my job as a Registered Nurse. Today I am probably another 15lb heavier than a year ago, about 40lb higher than my lowest weight ever. I am trying to psych myself up into running outside in the cold, but I am struggling. I am a Group Exercise Instructor, and I teach indoor cycle classes. I am trying my hand at yoga and absolutely loving it. I am still a Registered Nurse, but I have changed jobs twice since last year, and my new job only exemplifies my baby fever (not a bad problem I guess). Matthias is my Husband, and it still moves me to tears that I got so lucky with him. He’s been by my side this whole rocky journey and it makes me love him even more. I never thought I’d want kids, but alas, we do, and hopefully something will come of that sooner this year. I am registered for Yoga Teacher Training, and I’m internally freaking out about money and feeling ready enough, but I am trying to use my ujayi breathing to help me cope with that I’m up 3 pets from the first year I started writing here. Which is cool and crazy at the same time. I eat organic meat (and heck even non-organic meat) once in a while, but it grosses me out to prepare. I don’t track my calories anymore, but I do wear a fitbit. My whole exercise routine has changed over the last year, but my heart feels fuller and more committed now than it did before. I feel emotionally strong and stable. I feel beautiful on the inside, as well as on the outside, cellulite and curvy thighs and all. I am proud of my career, my family, and the life that I am working on creating with my Best Bud Matthias. Things are good.